If you have other Schwab accounts, you may be presented with a list of all of your accounts. 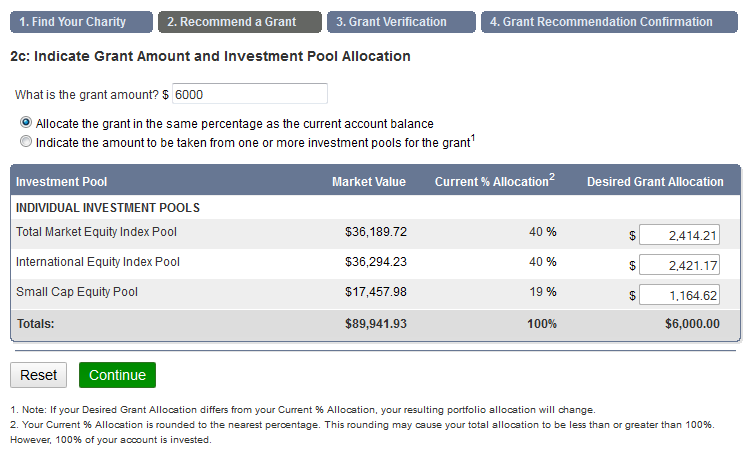 Find the one designated a “Charitable Gift Account”, e.g. Click on this account to begin viewing it. Schwab provides a great deal of information and statistics on your charitable giving. We will only focus on how to execute a gift in this blog post. 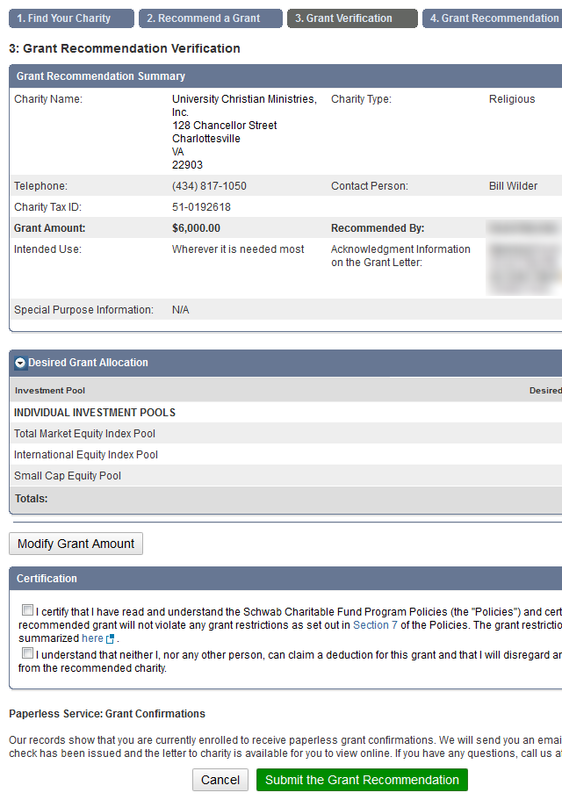 Click on the top tab “Grant to Charity”. The first step is to find your charity. (The process becomes much easier once the charity is in your gift history.) 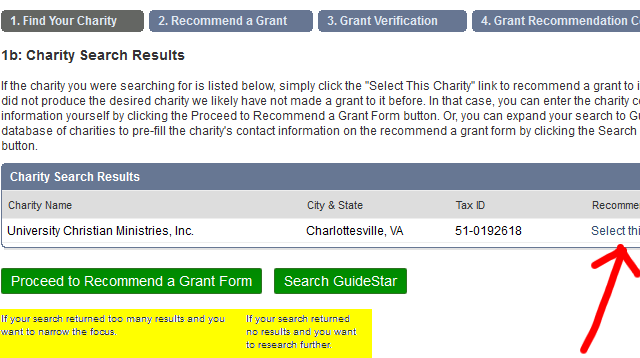 You can search for your charity either by name or by Tax ID Number. Remember that the official name of a charity is often not the same as the name you may know it by. For example, here in Charlottesville, the official name of the Center for Christian Study is “University Christian Ministries”. If you search under the common name a similar ministry in Richmond Virginia will be the only one found. If your charity is among those listed, the second step is to click on “Select this Charity” next to the appropriate ministry. The odds are that someone else has given to the same charity and it is in the database. Only if for some reason your charity is not listed or there are too many search results should you use the buttons at the bottom. In Step 2a you are given information about the charity selected in order to verify that you have found the correct charity. 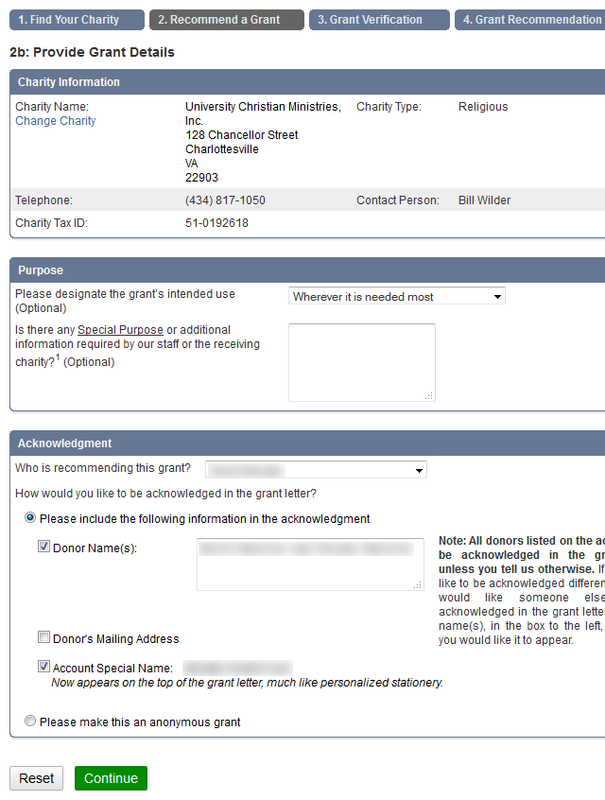 In this case I know that the charity’s address is at 128 Chancellor Street so I know I have the correct charity. Schwab Charitable Donor Advised Funds make the process easier for transferring a collection of appreciated stock once and then giving many smaller gifts throughout the year.